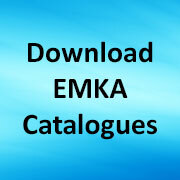 A while ago EMKA took a look at the way that machinery cabinets are often been equipped only with simple mechanical locks, which while adequate when respected, are vulnerable to abuse by anyone with a standard key. With this in mind we developed a new program of long life battery based radio security swinghandles, designated Agent E, with the specific aim of meeting equipment requirements such as the new EC Machine Directive. This enables the release of handles to be actioned remotely as well as control event logging. Contact us for quotation or further details. Share the post "Agent-E – wireless access security"
Previous post: We make a case for hardware…..